be quiet! 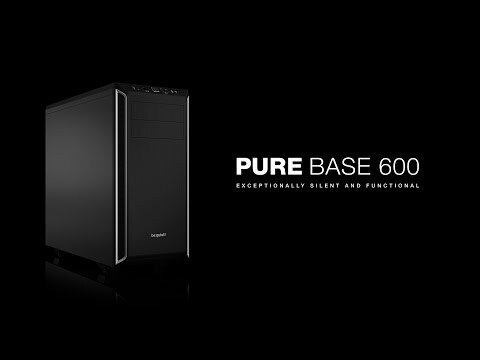 Pure Base 600 Black Mid Tower Computer Chassis, ATX/MicroATX/Mini-ITX, 2x PureWings Fans, 3-Speed Fan Control is rated 5.0 out of 5 by 1. Rated 5 out of 5 by Jaitch from Agrophobics, Beware I'm one of the people who tends to re-use old cases and didn't realise the strides that had been made in their design. This case is really all things to all men (& women!). First of all, the quality of build is excellent, really solid and well built, with a lovely semi-matt black finish. It is well suited to either air or water cooling, but tends to neither, in that it has a removable top for those who wish to fit radiators, but, with an adjustable height when fitted, does not confront air coolers with a huge unfilled opening. A radiator may also be fitted to the rear. There is space for five removable cages (you are provided with three) for 3.5" HDDs, each cage will also hold 2 SSDs. I have mounted my SDD on one ot the two alternative SSD only mounts behind the motherboard. Coupled with using just one of the cages for a large HDD, there is enough room left to hold a ball. There are 2x 5.5" bays of a more traditional nature, but I can't bring myself to break the beautiful lines of the front, so have an external optical drive on my desk ... which I find very handy and accessable. As well as the usual audio and 2x USB ports to the front, there is also a discrete three position switch to control the speed of up to three case fans. Not being an overclocker, I have mine set to minimum, which, with the be quite! fans provided, results in a beautifully quite environment ... provided you choose your graphics card carefully. It grieves me to say that I can't really find anything about it not to like ;-) All in all, what you might expect of German engineering. Good value for money - hightly recommended.